Served in the Army Signal Corp & Ordinance Branch, in a variety of assignments as a Communications & Electronic (C&E) Technician (Tech), Dial Central Office Tech, Shop Forman of a C&E Repair Facility X2, Drill Sergeant Fort Sill, OK, Communication Site and Command & Control Center Inspector & Evaluator and Senior Enlisted Adviser to Brigade Commander 1st SIG Brigade Project Support Directorate. I served 22 years of active duty and 10 additional years as a Dept. of Defense Contractor with Northrup Grumman. I grew up in the East Harlem area of New York City playing foot, roller and then ice hockey. I joined the service and while on active duty stationed in Belgium had the privilege of playing stand-up hockey in the Belgium International Hockey Association (BIHA) for 5 years. Again, while station in Germany had the privilege playing throughout Germany for 6 years and that pretty much ended International Hockey playing. We returned to the United States in 2006 after serving, retiring and working in Seoul, South Korea for about 14 years. In 2010, while working US Postal Service and talking “Hockey” with a co-worker who’s also a disabled veteran, he told me about the Buffalo Warrior Hockey Program thru the VA. I started out playing with the Stand-Up team for about a 1 ½ season until my service connected injuries worsened and I could no longer play Stand-Up hockey. I have degenerative issues with my back, lower lumbar, paralysis and sciatic nerve issues in my left leg, which do not allow me the capability of playing stand-up hockey. I tried hockey in the Sled or the “Bucket” as we call it and that was history!!! I am currently starting my 5th season in sled hockey and have also been playing on one of the local hockey teams for the past three (3) seasons with the Ontario Sledge Hockey Association (OSHA). 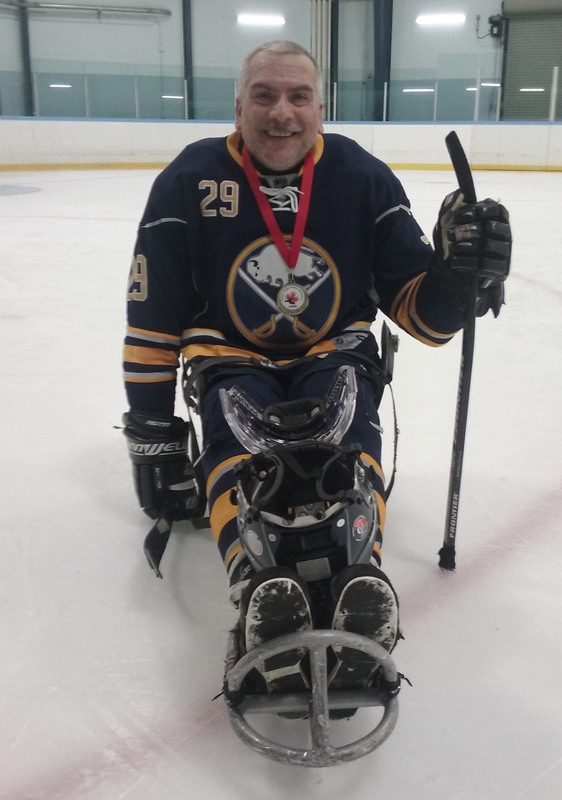 The Buffalo Veterans Administration Medical Center and Buffalo Sabres Warrior Hockey Program have created an “Out Standing Team”, providing disabled veterans like myself with an outlet for us to battle with our mental and physical disabilities. Being a part of the VA’s Sled Hockey Team fills a huge hole in my social life since retiring from the military. This the program provides camaraderie amongst my fellow comrades in arms who also suffer from their disabilities. When on the ice sled hockey allows us to forget about our aches, pains and mental torments and truly enjoy playing the game. Sled Hockey has done wonders for me.